With a peak course elevation of about 8,800 feet above sea level and a race route that follows a long, gradual descent to the finish line at about 7,400 feet, Utah’s Crandall Canyon Memorial Run easily qualifies as one of the highest-elevation races anywhere in the United States. The race unfolds through the spectacular natural beauty of Utah’s Manti-La Sal National Forest, whose more than 1.4 million acres stretch from just south of Provo at the forest’s northern end all the way southward to Capitol Reef National Park and the Glen Canyon National Recreation Area at its southern end. 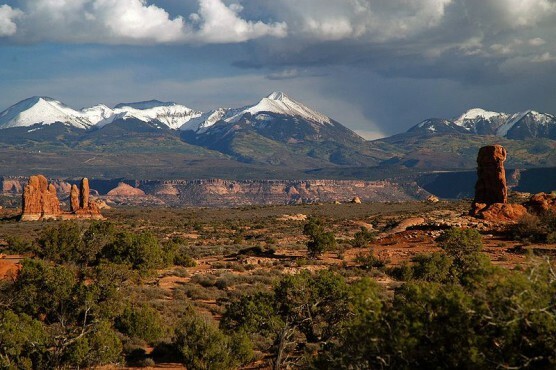 The cooler, high mountain peaks and forests at Manti-La Sal’s northern end — some of which reach as high as 12,000 feet — stand in contrast to the towering red rocks and natural arch rock formations at its southern end, which lie several thousand feet below and are known for their much warmer weather, especially in the summer. Runners in the half marathon, like those in the 10K and 5K races, will start their day with the race packet pickup in Huntington City Park, from which they will be shuttled by bus to the race starting line in the forest, near the Cleveland Reservoir. From there, they follow a course that winds along Utah’s Highway 31, first northward toward Electric Lake, and then southward all the way down along Highway 31 — which parallels the winding Huntington River, popular for its fly fishing — to the finish line near the entrance to Crandall Canyon Mine Road. The name of the race honors the memory of the miners and rescuers who lost their lives in an 2007 accident at Crandall Canyon Mine, a bituminous coal mine in Utah’s Emery County. The mine collapsed in early August, trapping 6 miners, and three rescue workers in search of the trapped miners also died when the mine suffered a second collapse just over a week later. That the race takes runners along some of this state’s most beautiful and remote scenery, and that it finishes near where the miners and rescuers still lie, serves as a testament to their memory both for local residents and the runners who come from around the region to take part in the event. Located just east of the Manti-La Sal National Forest in central Utah, just under 100 miles south of Provo, Huntington typically experiences its second-warmest weather of the year in August, which also sees just shy of an inch of rainfall for the entire month. See the race route map for the Crandall Canyon Memorial Run Half Marathon here. To reserve your spot in the 2019 running of Utah’s Crandall Canyon Memorial Run Half Marathon, 10K or 5K race, register online at RaceEntry.com here. Ever run in the Crandall Canyon Memorial Run? Share your impressions here, or post your review in the Comments below. Hello. We are driving from salt lake. We are confused on the instructions for the race. Do we meet the bus at 5:15 and it takes us up to the start of the race? Do we get a shirt or anything else? Is there a packet pickup on Friday? In my group, there are people doing a 10k and 5k. Is it the same bus? Do we have to do anything to identify ourselves or bring anything to the run?